Large stylish 3 storey, 6 bed house in a quiet village. This large village property is located 10 minutes from the town of Derval. This lovely 3 . . . Stylish 4 bedroomed house sitting on the edge of central Guémené-Penfao, 20 minutes from Redon. 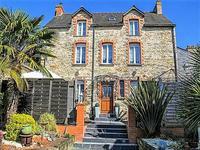 A stone house with 4 bedrooms, pretty garden and a large outbuilding. An hour's drive from . . .
Charming 3 bed house set in lovely gardens just 10 minutes from Derval. Pretty house in a quiet setting with 3 bedrooms, living/dining room/kitchen, sitting on a . . .